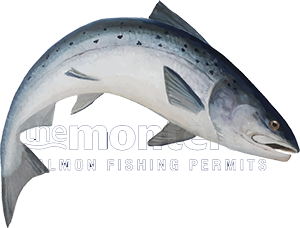 Having an good logic based understanding of how salmon behave after they have been caught is always going to be worth knowing whether you're a ghillie or a fishing guest. Here's a few of my river life career observations for you to chew on! One of the River Tay salmon beats I used to work on wasn't the best of salmon holding beats so you really had to watch for the signs of running fish and know exactly where their flight paths were in all water conditions and where they were likely to briefly stop. During the early months of the season when you had only 'transients' and very few 'residents' I observed a few interesting behavioural traits that I'm completely convinced of are factual and now play a big part of the fishing success of any salmon beat. Before the days of mandatory 'catch & release' for Spring salmon and before I contacted the Scotsman in 2006 to properly explain the plight of the diminishing River Tay Spring runs and how an 18% release rate for Spring salmon on the Tay at that time was a death spiral for the complete obliteration of God's finest run of salmon I constantly observed the following. Early running Spring fish that had been hooked, landed and removed from the Tay on one of these non holding area flight paths would in most cases leave behind other fish that would periodically show in the exact area that fish had been hooked and landed at. Strange though that exactly 5 years after the Spring run on the Tay got a better level of protection thanks to a bit of much needed Scotsman 'sensationalism' the river was once again full of Spring fish. True rocket science at it's very best! Some of these high water salmon 'flight path' areas were the most unlikely spots on that particular Tay beat that were never or could ever be regarded as proper salmon holding areas even though they became just that over the following days or weeks before these other fish eventually moved on again. On the once prolific Scottish West coast rivers before the 'globalist' favouring governments decided to betray wild Atlantic salmon and the delicate sea loch ecology by turning our beautiful West coast sea lochs into large scale 'poison' manufacturing factories I'd often see in the gin clear river water other salmon following the distressed fish I was playing as a sign of loyalty or defence. On the bigger rivers like the Tay you seldom see these other shoal members following the hooked salmon but if you watch carefully over the following days or weeks you may observe the salmon that has been caught & released stay in that very area where it was interviewed! It has been proven by radio tagging salmon that have been caught that they don't recommence their upstream journey immediately and can and often hang about in the same 'capture' location before eventually moving on again. When a dominant 'lead dog' fish in a shoal of salmon attacks a fly and gets caught, released & in effect 'stopped' it is logical that its colleagues will stop too and this I have also witnessed over the years. Maybe obscure thoughts & observations like these are too much information but the bottom line is I 100% believe that when a salmon is caught and released that particular fish and other shoal members often stay behind in that exact location for a certain period of time. Even when a salmon is released the surprise of the temporary 'alien abduction' will keep that salmon in location for days, weeks or sometimes even longer before moving on again. The above scenario in effect is setting up 'decoys' for other running salmon to stop as we know these creatures are not lone wolves and like company. The value of stopping early running Spring salmon on any salmon beat should not be under estimated!